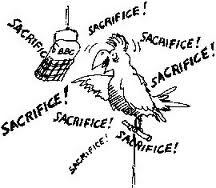 I have this little dog barking in my head, particularly when I hear the word sacrifice. There is so much of reverence and a laurel’s wreath bequeathed, I stand correct a halo drawn over this word sacrifice. We are being subjected to the great sacrifice of the Gandhi-Nehru amalgam, and the freedom struggle, well to be honest they were the apostrophes and nothing else the thought and the intent began long before them and still continues. The really important kind of freedom involves attention, and awareness, and discipline, and effort and being able to truly care about other people and to sacrifice for them over and over in myriad petty little unsexy ways, every day. —something that is very precious, like the story of Humyan of the Mughals. When Humayun fell fatally ill, Babur called the Hakim, the Hakim told him I can cure him but you have to sacrifice something Babur was willing to give all his wealth but Humayun did not recover, it was then Babur realized that the most precious thing to him was his life. So Babur offered to give up his life for his son, and the posterity said so be it. I guess it is just a part of loving something, we give some things up, and sometimes we have to give the very people up. Sometimes when we sacrifice something precious we are not really losing it, we are just passing it on someone else. If you were to really look at it sacrifice is no big deal, it is a choice we make, why exactly we make that choice depends on our need of that moment. Does that make sacrifice a self-centred action? I wonder. Previous PostPrevious Honey moon travels.